Skandinavisk Forenings Kunstnerhus in Rome presents young Nordic and Italian video art. The intention is to increase the dialogue between the Roman arts-scene and Skandinavisk Forenings Kunstnerhus and in a wider perspective between Italia and the Nordic Countries. 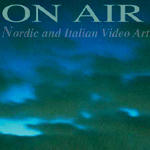 The serial of video-works titled ”ON AIR – from North to South” refers to the concept of transmission as well as to the concept of atmosphere, circling around themes of landscape as well as media and communication. The contemporary images are streaming constantly through the channels of transmission as well as through the surrounding atmosphere. The program includes works by the following international artists: J. Tobias Anderson (Sweden), Lauri Astala** (Finland), Elina Brotherus** (Finland), Emanuele Costanzo (Italy), Jesper Fabricius/Jesper Rasmussen (Denmark), Marit Følstad (Norway), Globalgroove (Italy), Crispin Gurholt (Norway), Petra Lindholm (Finland/Sweden), Marco Raparelli (Italy), The Icelandic Love Corporation (Iceland), Milja Viita** (Finland). Director of Skandinavisk Forening. Perregaard has worked individually and in collaborations with other artists on shows, catalogues, books and promotion. In 2005 she published the book ”SOLBILLEDER / En Fotografisk Rejse fra Rom til Konstantinopel” , ”SUN PICTURES / A Photographic Journey from Rome to Constantinople” , editor Sfinx, DK. Lorella Scacco is a critic, a journalist and an independent curator of cultural events. Graduated in arts’ history and aesthetics, she has curated exhibitions and catalogues for contemporary art in public and private exhibitions in Italy and abroad. Specialized in contemporary art from the northern countries of Europe. Collaborating with the university ”La Sapienza” in Rome and with specialized magazines. Author of the book ”Media-aesthetics. From Jean Baudrillard til Derrick de Kerckhove” published by Guerini, Milan 2004.